The problem with a good dystopian novel is that it doesn’t feel all that fictional. Instead it is worryingly, frighteningly plausible. 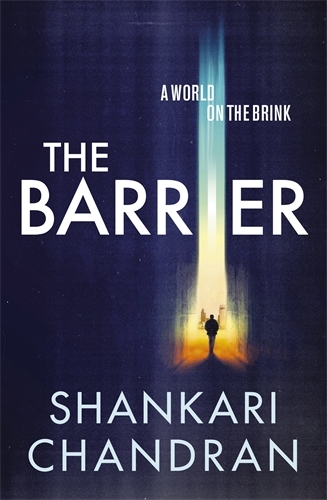 So I feel guilty about recommending Shankari Chandran’s THE BARRIER to anyone who wants to sleep at night or believe in the long term future of humankind. But if you’ve already given up on those pursuits or feel you are strong enough to withstand the desire to start carving out your own bunker you should dive in…the book is a helluva ride. Everything about THE BARRIER is designed to be as deliberately unsettling as possible for the reader. First we’re taken to the near future – one most of us are likely to be around for – and provided with an alarming but never laughable history of what has happened between our present day and the year 2040. A combination of disease, war and commercial interests have forever altered the global political and social landscape. The world is essentially broken into two zones or alliances – Western and Eastern – but the masses on both sides of the divide are routinely lied to and abused by their respective leaderships. All in the name of protection. The book’s protagonist – Noah Williams – is a scientist and Agent for the Western Alliance. When we meet him he is carrying out an interrogation. Something he excels at by using whatever means are necessary, including torture. He is then tasked with the novel’s core quest: to locate and neutralise whoever is attempting to undermine the global regime of compulsory disease vaccination. In the average thriller there is at least one character who the reader can easily identify as ‘a hero’. Even if he or she kills this is usually done within boundaries that people sitting comfortably in their lounge rooms can find acceptable. Reading THE BARRIER I couldn’t help but think that it has never been more difficult to identify good guys and bad ones. Noah’s human frailties are one thing – he has suffered a personal loss and that grief clearly impacts him. But it is capacity for ruthlessness – which is matched by just about everyone around him – that is more awkwardly jarring. In some of the scenarios depicted in the book it is possible to discern what a more equitable or ‘correct’ course of action might have been, but at other times characters are presented with Sophie’s choice kind of scenarios where the awfulness of each selection is only marginally different. Though this is, I think, the author’s point. With a background in human rights law Shankari Chandran brings a unique perspective to creating genuinely thought-provoking ‘fiction’. I imagine I will forgive her for doing so one day. When the nightmares are under better control. Most of the novel’s action takes place in Sri Lanka and this unfamiliarity of setting just adds to the overall unsettling sensibility I assume the author was aiming for when scaring me senseless writing this novel. It is here we do meet the most traditionally heroic character of the story and Chandran does a great job of juxtaposing this character with the pragmatic brand of evil displayed by most of those around him. This includes the country’s President who is not exactly warm but who nevertheless expresses some of the most memorable sentiments of the book. However harsh they might sound it is impossible not to imagine thoughts like his are driving many world leaders and decision makers already, let alone in the wake of the war and destruction that Chandran posits for our collective, imminent future. THE BARRIER is not a good-triumphing-over-evil thriller nor a comfortably dismissible work of science fiction. It is at heart a thought experiment in which humankind deals poorly with the challenges presented to it. Choosing rough justice, commercial interests and the wholesale eradication of civil liberties over anything that resembles human rights. There’s no getting around the fact it paints a bleak picture, not least because it highlights just how fragile our collective hold on civility really is, and I cannot honestly recommend to those looking for something light or hope-filled. But if you enjoy books that pose complex “what if…” questions and provide believable if undesirable solutions then find yourself a copy. And perhaps a blanket and a bottle of your favourite tipple. This is the 13th book I’ve read and reviewed for the 2017 Australian Women Writers Challenge. For more information about the challenge check out my challenge progress, sign up yourself or browse the Challenge’s database of reviews. This entry was posted in book review, Shankari Chandran (Aus), Sri Lanka. Bookmark the permalink. “It is at heart a thought experiment in which humankind deals poorly with the challenges presented to it. Choosing rough justice, commercial interests and the wholesale eradication of civil liberties”. That does sound horribly plausible, as – much though I’d like to believe that people are generally good and things will be mostly okay – fear, money and the need for control are all very powerful driving factors. Thanks for the kind words. I usually avoid this kind of thing these days – all too realistic and all that – but when I saw the author’s background and realised she has some first-hand knowledge of similar scenarios I couldn’t help myself. I’m still half-wishing I hadn’t but also glad I read it too. Oh, gosh, not for me, not now, thanks. We’ve got horrific hurricanes in Texas, Louisiana and worst of all, Puerto Rico; a mass murderer in Las Vegas; and a president who is playing head games with nuclear weapons. So I’ll pass. I just want to get up tomorrow, have good meals, read, watch TV news and have a few laughs.